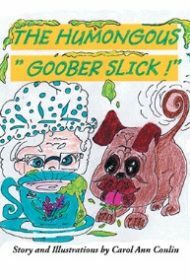 The Humongous “Goober Slick!” captures an afternoon with a woman and her mischievous pet pug. Told in rhyme from the perspective of an elderly woman spending the day at home, The Humongous “Goober Slick!” opens with a ringing landline the woman must tend to. While she’s out of her chair, her dog hurries over and slurps up her drink, leaving “A Humongous ‘Goober Slick’…running down my cup of tea.” She scolds the dog before collecting a new mug and settling back in. The story is followed by photographs of pugs and a coloring page. The Humongous “Goober Slick!” may appeal to readers with rascally pets themselves. However, several issues hamper its effectiveness. A large problem is the unusual formatting that arranges letters going downward when the word “down” appears and upward when the word “up” appears. It takes quite a while to figure out the upward text, as the “P” above the “U” proves highly confusing. Additionally, the narrowness of the story and its abrupt ending are not conducive to repeated readings, and young readers may find it hard to relate to the perspective taken—from the retro phone call to the focus on tea drinking. Words such as “evidence” and “sable seal puppy eyes” may also trip up early readers. Youngsters may be delightfully grossed out by the green slobber depicted on the woman’s teacup after her pug has accosted it, but that’s not enough to carry the story. The book requires revision before it can garner wide appeal. Also available in hardcover, ebook and audio book.